In January 2015, a Washington, DC, hobbiest accidentally flew his DJI Phantom quadcopter drone over the White House fence and crashed it on the lawn. Small drones have also proven to be effective tools of mischief that doesn't make the national news, from spying to smuggling to hacking. So when Mo Rastgaar was watching World Cup soccer and heard about snipers protecting the crowd, he doubted that they'd fully understood a drone's potential. "I thought, 'If the threat is a drone, you really don't want to shoot it down—it might contain explosives and blow up. What you want to do is catch it and get it out of there.'" So Rastgaar, an associate professor of mechanical engineering at Michigan Technological University, began work on a drone catcher, which could pursue and capture rogue drones that might threaten military installations, air traffic, sporting events—even the White House. 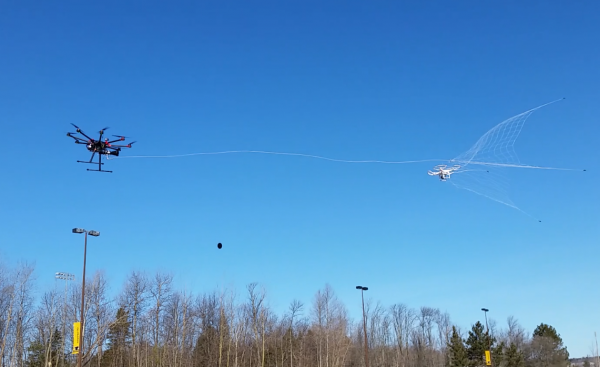 It's a deceptively simple system: a launcher that shoots a big net attached to a large drone by a string. The system can be autonomous, controlled by a ground-based human pilot or a combination of the two. Once trapped, the intruder doesn't have a chance, as illustrated in this video. "It gets really entangled," Rastgaar said. "It's not going anywhere." Then the net swings down below the drone catcher, which ferries its cargo to a safe location. "What makes this unique is that the net is attached to our catcher, so you can retrieve the rogue drone or drop it in a designated, secure area," Rastgaar said. "It's like robotic falconry." Rastgaar and Ficanha have filed for a patent on this drone catcher system and think that it could have several potential applications, from foiling spy drones, smugglers and terrorists to supporting federal regulations. "The FAA [Federal Aviation Administration] has just announced that drones must be registered, and we think the catcher could help enforce the law by catching unregistered drones," he said. Time for some erractic maneouver (or better yet: evasive maneouver) algorithms. Yea, I too would like to see it catch one that someone else was trying to keep away from it. Just shooting a net at one hovering in one spot isn't all that impressive.